As 2 legendary Super Heroes come face-to-face on the big screen for the 1st time, Warner Bros. Consumer Products (WBCP) has teamed up with a powerhouse slate of global licensees for a broad, multi-category licensing, merchandising and promotional program to support the highly anticipated action adventure film Batman v Superman: Dawn of Justice, directed by Zack Snyder, soaring into theaters on March 26. 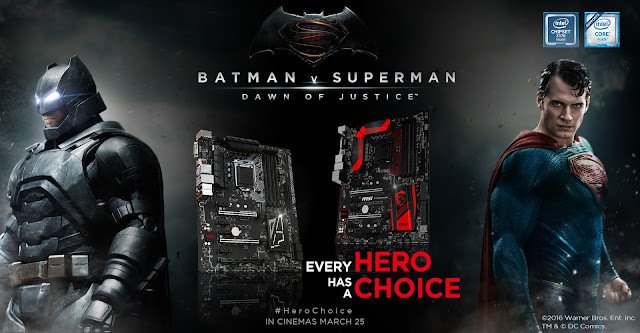 Revving up for Batman v Superman: MSI, world leader in gaming hardware design, is pleased to announce an exciting partnership to launch limited edition of gaming motherboard and graphics card in conjunction with the highly anticipated film. This partnership is in effect in selected countries (Taiwan, China, Thailand and Philippines), and is being celebrated by inclusion of hardware like the MSI Z170A GAMING M5 and MSI Z170A GAMING PRO CARBON motherboards, and the MSI GTX 970 GAMING 4G and MSI GTX 960 GAMING 2G graphics cards. Made for enthusiast gamers whose main goal is to master their favorite game. The Z170A GAMING M5 motherboard is designed to provide gamers the finest gaming experience through genuine GAMING design with heavy plated heatsinks and unique MSI PCB architecture, best-in-class gaming features in terms of speed, sound, stability, and the latest cutting edge technology. Like the ultra tech Bat suit, the Z170A GAMING PRO CARBON Edition motherboard full black color scheme is sure to offer outstanding performance and customization of your system Experience superfast online gaming with MSI GAMING LAN powered by Intel. Enjoy crystal-clear and immersive sound while gaming courtesy of the premium quality components of Audio Boost 3. Load your games in a blink of an eye with blazing fast Turbo M.2 data transfer speeds of up to 32Gb/s. Steel Armor ensures the most heavyweight graphics card setups are solid and stable. Engineered to provide both a stunning gaming and visual experience, the Z170A GAMING PRO CARBON Edition sporting the latest version of Mystic Light gives you plenty of reasons to show off. The best-selling MSI graphics card with more than enough punch to enjoy the latest games in all their splendor. With the powerful NVIDIA Maxwell GPU at its heart and 4GB of GDDR5 memory, the GTX 970 GAMING 4G was one of the first cards to come equipped with the famous Twin Frozr V thermal design, which provides a cool and silent gaming experience. The GTX 960 GAMING models combine great power with efficiency at an attractive price. Perfect for playing the most popular MOBA games, they also run the latest triple A titles at modest settings. Also equipped with the famous Twin Frozr V thermal design, your gaming rig will remain supremely silent, letting you focus on the game. All MSI GAMING graphics cards use Military Class IV components, which means improved durability, stability and efficiency. Military Class IV components also enable better overclocking results when using MSI Afterburner, which means more performance in games.